In the world of electric toothbrushes, there are two brands that lead the competition: Oral B and Philips Sonicare. With each brand having lots of models available, we’ve often written about the difference between each and every model to help you with your purchase decision. Below, you’ll find a compilation of all comparisons posts for the most popular electric toothbrush models we’ve written about so far. What sets Oral B apart from Philips Sonicare is the round brush. This round brush works by rotating and oscillating around each and every tooth to give you 3D cleaning experience. It is very effective in removing plaque and polishing teeth. Oral B toothbrush heads are available in different designs to help you target a number of dental issues. Buy Guide for Oral B Replacement Brush Heads. Philip’s electric toothbrushes work with Sonicare technology that provides up to 31,000 strokes per minute. These rapid strokes work on removing more plaque than manual brushing and improving gum health. Sonicare’s brush heads look like a manual toothbrush, but they’re available in different sizes and hardness levels to suit every need. Oral B 8000 vs. 7000 vs. Sonicare Diamond Clean – Which Is Best? Oral B, the leading brand for Electric toothbrushes, is always working on improving their line of products. And what we’re about to look at now is an example of how innovative their toothbrushes are and the amazing experience they can give you. In this post, we’ll be looking at the features of Oral B GENIUS 8000, Oral B 7000, Sonicare Diamond and how they all compare to each other. 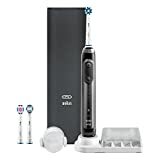 Bluetooth enabled electric toothbrush connects to your smartphone or tablet to activate many smart features. Position Detection uses facial recognition to show you which zone you’ve brushed and which you’ve missed. Smart Travel Case doubles as a power bank and allows you to charge your toothbrush and your smartphone at the same time on the go. Customizable multi-color Smart Ring gives you instant feedback and visual coaching on brushing and pressure to help you brush just like your dentist recommends. Pressure sensor automatically slows down the brush speed and alerts you to eliminate you from over brushing and hurting your gums. 6 Cleaning Modes: Daily clean, Pro Clean, Sensitive, Gum care, Whitening and Tongue Cleaning. Includes 3 refill brush heads, a suction cup phone holder, charging base and a storage case for brush heads. 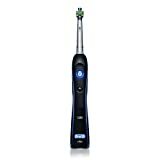 Click here to learn more about Oral B 8000, read the customer reviews and buy it. Oral B 8000 vs. 7000, What’s The Difference? The travel case of the Oral B 7000 does not have the charging capability. So when traveling, instead of using the Travel case to charge your brush like the Oral B 8000, you’ll have to use the corded charging base. Oral B 7000 has a wireless Smart Guide which displays the 2-minute timer and shows you which cleaning mode you’re using. On the Oral B 8000, the timer is built-in and the cleaning mode indicator is also on the brush handle. Oral B 7000 does NOT have the customizable Smart Ring. No Position Detection on the Oral B 7000, either. The Smart Guide of the 7000 guides you through each zone of your mouth, but it does not give you details of your brushing activity like the Oral B 8000 would, which uses facial recognition to let you know if you’ve missed any part of your teeth. Click here to learn more about the Oral B 7000, read the customer reviews and buy it. The Oral B electric toothbrush rotates and oscillates with a round toothbrush to give you 3D cleaning for every tooth. While the Sonicare toothbrushes have the same traditional-like brush heads. It uses Sonic technology to provide up to 31,000 strokes per minute. Diamond Clean features 5 brushing modes: Clean, Deep Clean, Sensitive, White and Gum Care. So Oral B 8000 has one extra cleaning mode (Tongue Cleaning). Diamond Clean has a unique Cup charger and a charging travel case. The Cup, which can also be used for rinsing, has an induction base, so once you put the brush handle in it, it starts charging. As for the travel case, like Oral B 8000, it has a built-in battery that allows you to charge the toothbrush and any other USB device. Diamond Clean comes with a total of 3 brush heads, like the Oral B 8000. It has a built-in 2 minute timer. The Sonicare Diamond Clean does NOT have Bluetooth connectivity or a companion app. Click here to learn more about the Sonicare Diamond Clean, read the customer reviews and buy it. Fitbit Flex 2 vs. Flex 1 vs. Alta, What’s The Difference Between Them? Fitbit Flex has been around for quite sometime, making it a popular choice among users who wish to track their activities. With the release of the Fitbit Flex 2, if you already own a Flex band, then you must be wondering whether or not it is worth it to upgrade. 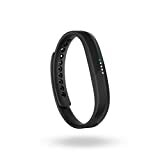 If you’re a first time buyer, you might be contemplating whether to go for the new Fitbit Flex (obviously) or the very similar Alta band, also by Fitbit. All these questions will be answered in this post that will hopefully help you with your buying decision. Ultra-slim design with a removable tracker module that can be moved and fitted into other accessories like bands, pendants or bangles. Swim-proof for tracking swimming activities. Tracks steps, distance, calories burned, active minutes, and sleep quality. LED indicators light up to show you your progress towards your daily goal. SmartTrack automatically recognizes and records them to your Fitbit app. Receive color-coded text and call notifications from your phone. Silent alarm wakes you up by vibration. Data syncs wirelessly from your band to your Fitbit app on your smart device. Compatible with iOS and Android devices. 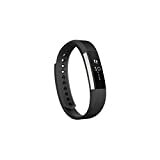 Click here to learn more about Fitbit Flex 2, read the customer reviews and buy it. How Is The Fitbit Flex 2 Different Than Flex 1? When it comes to tracking, both Flex and Flex 2 track the same activities: steps, active minutes, distance, calories, sleep quality. However, Flex 2 is the first swim-proof band from Fitbit that allows you to track swimming activities. Also, Flex 2 has SmartTrack technology that automatically recognizes some workouts and records them in your Fitbit app. Flex 2 is noticeably slimmer than the Flex. It also has a different clasp design that works better than the first one. Flex 2 is available in 4 colors: Black, Lavender, Magenta and Navy. Additional accessories for Flex 2 allow you to change how you wear your tracker: either in a necklace (pendant) or a bangle available in Gold, Rose Gold or Silver. The original Flex band didn’t receive any notifications from your phone. Now, the Flex 2 is able to receive call or text notifications. While you can’t view the text or caller ID, the notifications are Color-coded so each color will indicate whether it’s a call or text notification. You should expect the same battery life from both Flex 2 and Flex, up to 5 days. Flex 2 or Alta, Which Band To Choose? Fitbit Alta is not very different from Flex 2. Both bands have the same tracking features: steps, distance, calories, sleep quality and SmartTrack technology. Flex 2 and Alta both are able to receive text and call notifications, but additionally, Alta will receive Calendar notifications, too. And because Alta has a display, it can display the caller’s name and some part of the text message you receive. Also, it displays current time. So, to sum up, the biggest difference here is that the Alta has a display screen that actually shows you the details of your goals, text/caller ID and calendar alerts as well as current time. Like Flex 2, many interchangeable accessories are available for Fitbit Alta. Click here to learn more about Fitbit Alta, read the customer reviews and buy it. Braun Silk Expert vs. Philips Lumea, Which of these IPL Systems Is For You? What Is IPL Hair Removing And How Does It Work? IPL stands for Intense Pulsed Light, and it’s a technology used to permanently reduce and remove unwanted hair from the body. This technology works to target the melanin in the hair follicle underneath the skin, which helps break the cycle of the hair’s regrowth. As you continue to use this treatment, it will eventually stop the hair from reaching the surface of the skin. The IPL hair removal system works by placing the device on the body area you want to target and pressing a button which will release a light pulse targeting the hair follicle in that area. You continue to work on different areas of your body and repeat the process over a period of time until you see the desired results. It usually takes over 4 weeks to see real results, and once you notice hair growth has stopped, you’ll only have to do this process as a maintenance. There are many IPL Hair Removal systems for home use available on the market today, and we chose to review and compare the Braun Silk Expert and Philips Lumea as both are currently the best selling devices. Is IPL Treatment Safe To Use at Home? Yes, it is perfectly safe to use on your skin. The devices we’re featuring in this post don’t require you to wear goggles as they only flash when they come in full contact with your skin. They also automatically adapt to the tone of your skin to provide with the correct light pulse intensity. Will IPL Give Me Permanent Hair Removal? What To Expect? No, these systems are made to give you permanent hair reduction. This means that after doing the treatment, you’ll notice visible hair reduction, little to no hair growth and if new hair growth occurs, it will be thin and no longer coarse. Before you decide on an IPL system, you have to check the chart for compatible skin tones for each device to make sure it will work on your skin and hair tone. Read on for more information on this. Clinically tested for permanent hair reduction. SensoAdapt sensor technology automatically adapts to your skin tone to ensure the right light intensity. The fastest IPL technology, allows you to treat a leg or an arm in just 8 minutes. Provides 120,000 flashes, equivalent to full body treatments for up to 6 years, or up to 14 years on smaller treatment areas such as the lower legs and underarms. Does NOT require any flash replacements, gels or any other separate purchases. Requires no batteries or charging. Works on full power corded for uninterrupted treatment. Gentle mode provides lower light intensity for first time users or sensitive areas such as bikini line. Glide mode for continuous use on large body areas makes the treatment a lot faster. Smart phone application available for iOS and Android devices helps guide you through the process, schedule your treatments and reminds you of future treatments. Click here to learn more about the Gillette Venus Silk Expert IPL System by Braun, read the customer reviews and buy it. Delivers up to 100,000 flashes for 4+ years of full body treatments. Choose from 5 light strength settings for different skin types. Skin tone sensor detects your skin tone at the beginning of the session or during to ensure you have the right light setting for your skin tone. Slide and Flash mode offers continuous flashing for large body areas. Provides up to 75% hair reduction after only 2 months or 4 treatments. Uses corded power, does not require charging. Application times range from 1-1.5 minutes for armpits and bikini lines to 11 minutes for the lower leg area. Click here to learn more about the Philips Lumea Comfort IPL System, read the customer reviews and buy it. What Is The Difference Between Silk Expert vs. Philips Lumea? Now, this is a very important feature to note. In older models of IPL systems, you had to buy replacement flashes to continue using your device. This added additional costs to your initial purchase, which isn’t something that anyone wants. In the Braun Silk Expert and Philips Lumea, there are no additional costs for replacement parts. You get to use the device for several years until all flashes are used up. In Silk Expert, the device delivers up to 120,000 flashes, which rounds up to 6 years of use. In Philips Lumea, it delivers up to 100,000 flashes, which is over 4 years of use. With Silk Expert, the skin tone sensor automatically detects your skin tone and adjusts the right light intensity accordingly, which takes the guess work out for you. With Lumea, the Skin Tone Sensor is more of a safety feature. You manually choose from 5 light energy levels and the skin tone sensor will detect your tone at the beginning of the treatment, if it detects a darker shade, it will automatically shut off the pulses. The Silk Expert has Gentle Mode which is used for first time use and for sensitive areas. And Glide Mode which will allow you to continuously treat large body areas. The Lumea doesn’t have a gentle mode, but you can manually choose the lowest settings for sensitive areas. It has Slide and Flash mode for continuous use. The Philips Lumea is more compact in size. The Silk Expert is larger in size, but has an ergonomic design that makes it more comfortable to hold. 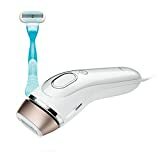 The Braun Silk Expert is available in two packages (available at different prices), one includes a Gillette Venus razor (as the treatment requires that you shave before you start), and the second package comes with a Braun body exfoliating brush. Philips Lumea doesn’t include any accessories. It’s only natural that your decision might be affected by your budget. The Braun Silk Expert is rather expensive in comparison to the Philips Lumea. So, is it worth it that you spend more on your IPL device? It delivers more flashes, giving you an expected 2 extra years over the Lumea, which means 6 years of use for full body treatment. The skin tone sensor is more advanced. SensoAdapt technology means you don’t have to guess which light energy setting to use, it automatically chooses the setting for you based on your skin tone. What does this mean for you? Safer use and better results. Silk Expert is quicker to use. In fact, it is currently the quickest IPL technology available for home use (as of November 2016). The smart phone application is a huge plus. You might think this is just an extra perk, but it will make a huge difference in how you use your device. Since this is an ongoing treatment, you don’t want to forget your next treatment, or when you applied the treatment last and where to go next. The app helps you exactly with this. Philips Health Watch vs. Fitbit Blaze, Which One Should You Buy? Philips has always been a leader when it comes to health appliances and gadgets. But for a while now, Fitbit has been leading the Activity Tracking game with its many models. So, in this post, we’re looking at the difference between Fitbit vs. Philips Health Watch. Activity monitor with continuous heart rate monitoring. Monitors activity, heart rate and sleep quality. Automatically syncs and transfers your data to the Philips Health App (iOS and Android compatible). Philips health app gives you personalized guidance, shows you your daily goals for steps and calories burned, gives you insights of your sleep pattern and more. Battery life: up to 4 days. Fast charging, gives you about 70% of battery in about 30 minutes. Click here to learn more about the Philips Health Watch, read the customer reviews and buy it. To make this comparison as fair as possible, we’re comparing the Philips Health Watch to the Fitbit Blaze as it’s the closest thing to it in terms of features and price. Connected GPS traces your running or walking routes and shows you maps on your phone for later reference. Automatically syncs and connects to your iOS or Android device. Compatible with up to 200 fitness apps available on App Store or Google Play. Receives and displays phone notification like texts, emails, calls and calendar alerts. Allows you to control music on your phone. Swap between different watch faces. Choose from many band colors. Can be customized with additional bands and frames (sold separately). Click here to learn more about the Fitbit Blaze, read the customer reviews and buy it. What Is the Difference Between the Philips Health Watch and Fitbit Blaze? At their core, both the Philips Health Watch and Fitbit Blaze offer the same activity tracking that helps you improve your daily lifestyle choices. You’ll get information on your steps, calories burned, workouts, sleeping and more. However, for less the price, the Fitbit Blaze offers more features that gives it a better value than the Philips Health Watch. It shows you notifications from your phone like calls, text messages, emails, calendars. It allows you to control music on your phone. It is compatible with 200 fitness apps already available for iOS and Android, as well as the Fitbit app. It has built-in GPS to save your running or walking routes on a map. It is customizable with swappable watch faces and bands and frames that can be purchased separately. We believe that the Fitbit Blaze offers a lot for the money, especially in comparison to the Philips Health Watch. Whether you’re a beginner or an athlete, trying to lose weight or simply want to maintain a healthier lifestyle, you’ll be getting a much better experience using the Fitbit Blaze. 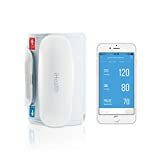 However, it is worth mentioning that the Philips Health Watch is a part of complete health solution that includes a smart connected scale and a smart connected blood pressure monitor, which all connect to the same Philips Health Suite app to give you a full insight on your overall health. Yet, we still believe that the Fitbit Blaze has the best value for its price and for us, it’s the clear winner. Withings Body vs Body Cardio WiFi Scale, What’s The Difference? Following up on our continuous Withings WiFi scale comparison, in this post, we’ll be looking at the difference between the Withings Body vs. the new Body Cardio scale. Gives you full measurements of your weight, BMI, fat, muscle, bone mass and water weight. Measurements is wirelessly sent to your smart device (phone or tablet) and can be also viewed on the web (Withings’ website). Using the app, set up your weight loss target, track your calories intake and weight loss progress. Scale is also compatible with up to 100 other fitness apps already available on the app store or Google Play. Setup up to 8 users with automatic user recognition. Click here to learn more about Withings Body, read the customer reviews and buy it. Gives you measurement of weight, BMI, fat, muscle, bone mass and water weight. Heart Health Management: get heart rate and Pulse Wave Velocity assessment, which is a medically-accepted metric of arterial stiffness, for a complete picture of cardiovascular health. Automatic wireless sync to your smart phone or tablet to show you all your data. Use the app to set your daily goals, calorie budget, see your weight loss progress and more. Multi-user: set up to 8 users with automatic user recognition. Click here to learn more about Withings Body Cardio, read the customer reviews and buy it. What Is The Difference Between Withings Body and Body Cardio Scales? The Withings Body Cardio has the feature which allows you to measure your heart’s health along with your other body measurements. Body Cardio gives you great inside of your overall heart health and fitness. It measures Pulse Wave Velocity; a medically-recognized heart health metric that tracks the rate of blood flow, which can be an indicator of arterial stiffness, high blood pressure, and general cardiovascular health. Withings Body Cardio has built-in battery that lasts for up to 12 month and can be recharged using the included USB cable. If you, or someone in your family, has a history of heart disease, then the Withings Body Cardio would make a great choice. As of the writing of this post (Sept 2016), it is the only smart scale on the market that’s able to track heart health. Keeping track of your heart’s health is important for you to know your health and fitness level and makes it easy to share data with your doctor whenever needed. iHealth Core vs. Withings Body WiFi Scales, Which One Should You Buy? Some people might see a WiFi body composition scale as just another overpriced gadget. However, for anyone who is serious about weight loss and overall health, this type of scale is a must. Using a traditional scale, you can only tell what you weigh without knowing what makes up this weight. While a smart scale breaks up the weight for you so you can really understand your weight. We have previously compared two great WiFi Scales: Withings Body vs Fitbit Aria. We also looked at the different between Withings Body models WS-30 vs WS-50. In this post, we will be comparing the Withings Body to iHealth Core. Measures weight, body fat, lean mass, muscle/bone mass, water weight, daily calories, BMI, and visceral fat rating. Easy WiFi pairing using a QR code. MyVitals app, available for iOS and Android, shows you your daily goal, tracks your process, vitals and more. App allows you to share your data with your doctor in excel or pdf format. 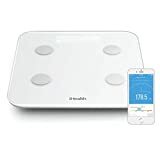 Click here to learn more about iHealth Core WiFi scale, read the customer reviews and buy it. Measures weight, BMI, body fat, muscle, bone mass and water using Position ControlTM technology. Automatic data syncing to the Health Mate App (iOS/Android). Supports up to 8 users. Track your weight goal, daily calories intake and more. Compatible with over 100 fitness apps. Daily weather: The scale shows you the weather when you step on it to help you plan your day. Click here to learn more about Withings Body WiFi scale, read the customer reviews and buy it. What Is The Difference Between the iHealth Core vs. Withings Body? Both measure the same body composition of weight, BMI, muscle, bone mass and water weight. Both have apps that are compatible with iOS and Android devices, meaning you can have your data sync to your smartphones or tablets running those operating systems. However, Withings Body also syncs with other apps. In fact, it is compatible with up to 100 other health apps. When it comes to supported users, the Withings supports up to 8 users while iHealth supports up to 10. If it matters to you which app you use with the scale, for example if you’re already using another health app and would like to continue to use it, then you’d love the fact that the Withings Body can work with so many apps. Withings also has a web based app that you can access from any browser. Your other choosing factor would be price. Both are at the same price range but we would recommend you check if there’s any available offers whenever you’re ready to purchase and compare prices then. If you’re someone with a medical condition who needs to constantly check their vitals like Blood Pressure or Hear Rate, a wireless blood pressure monitor is a must-have for you. Long gone are the days of bulky BP monitors that make monitoring your BP a dreaded thing. Wireless blood pressure monitors are portable and easy to use anywhere around your home or outside. 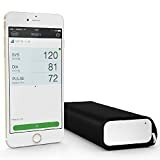 Another great benefit of having a wireless blood pressure monitor is the fact that these monitors connect wirelessly to your phone and store your data in an easy to use applications. This is perfect for going through your data history and sharing it with your doctor. In this post, we’ll look at 3 of the top rated wireless blood pressure monitors on Amazon. Automatically syncs readings with your iOS or Android device on the Health mate app from Withings (Free). Data can be transferred wirelessly (Bluetooth) or wired. Automatically compares your readings to the World Health Organization standards to give you an easy way to understand your data. Multi-user capability: set up multiple profiles to store different users’ data separately. Health Mate App connects to other Withings products to give you a full overview of your health. Has a companion Apple Watch app. Click here to learn more about the Withings Wireless BP Monitor, read the customer reviews and buy it. 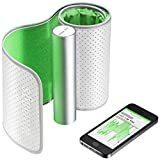 Smart upper arm cuff blood pressure monitor. Measures blood pressure and heart rate, with irregular heart rate detection. Works with iOS or Android devices. Compares results to World Health Organization. Validated to meet US and European standards. Qardio app features: triple measurement averaging, reminders, geo-tracking across locations and many more. Companion app on the Apple Watch and Androidwear watches. Click here to learn more about QardioArm BP Monitor, read the customer reviews and buy it. Upper arm cuff smart BP monitor. Automatic wireless sync via Bluetooth. Also measures heart rate with irregular hear beat detection. Each reading is evaluated against JNC guidelines and graphed against previous readings to track trends at a glance. iHealth app features: multi-user support, reminders, iHealth cloud dashboard, notes and much more. Full integration with all iHealth devices. Click here to learn more about iHealth BP Monitor, read the customer reviews and buy it. Withings vs. QardioArm vs. iHealth, What’s The Difference Between Them? Wireless syncing via Bluetooth (only Withings has wired syncing, too). Heart rate monitoring with irregular heart beat detection. Multi-user support, data comparison with World Health Organization standard and against your previous data. So, how do you choose one of them and how to know which one is the best? The Withings Health Mate app has simple and easy to read graphs, and it integrates with any other Withings product you might have, like their smart scale or smart watch. The Qardio app looks like the most comprehensive app as it shows you graphs, triple measurements, reminders and it geo-tags the locations of where you measured your blood pressure. The iHealth app has nice colorful graphs, too. It compares your readings to a previous one and to the standard World Health Organization and it sends you reminders, but it lacks the geo-tagging offered in the Qardio app. Although we think that the app functionality is more important than the dimensions in this type of product. It has a high rating from customers. Most importantly, it has the most comprehensive app, and the only one with a companion Apple Watch and Androidwear app. Waterpik Aquarius vs. Complete Care (WP-660 vs WP-900), Which One Should You Buy? What Is a Water Flosser and How How Does It Work? We all know that flossing is an essential part of dental care yet many of us ignore it. If you happened to have a dental issue, have braces or simply want to take extra care of your teeth and gum health, a water flosser should be an interesting thing to have. A water flosser uses water pressure and pulsation to deep clean between your teeth and gum lines. It’s a great way to get rid of any bacteria or plaque that traditional brushing or flossing can’t reach. Waterpik happens to be the leading brand when it comes to water flossers. That’s why in this post, we’ll be look at and comparing two of its water flosser models: Aquarius vs. Complete Care. Water flosser with floss and massage modes. Choose from 10 pressure settings. Pulse mode works best for plaque removal. Hydro-pulse massage mode provides improved gum stimulation and better circulation. Water reservoir capacity of 90-seconds (recommended daily use is 1 minute). On/off water control on the handle. Built-in one minute timer with 30 seconds pacer to alert of of switching sides to cover all areas of your mouth. Click here to learn more about Waterpik Aquarius, read the customer reviews and buy it. A complete dental care system that includes a water flosser and sonic toothbrush. Water reservoir with 90-second capacity. Sonic toothbrush includes two brushes: 1 Standard Brush Head- for all over cleaning 1 Compact Brush Head- for precision cleaning. Toothbrush charger is built into the unit. Does NOT have Hyrdo-pulse massage mode. Click here to learn more about the Waterpik Complete Care, read the customer reviews and buy it. What’s The Difference Between Waterpik Aquarius and Complete Care WP-660 vs WP-900? Waterpik Complete Care includes a water flosser as well as an electric sonic toothbrush. While the Waterpik Aquarius is a water flosser only. When it comes to features, both models are almost identical, although the Aquarius has a massage mode that the Complete Care doesn’t have. The water reservoir on both the Aquarius and Complete Care have the same capacity. The capacity here is measured in seconds, and Waterpik mentions that the reservoir holds enough water for 90-seconds use. The Waterpik Aquarius includes more tips for the flosser, 7 total. The Complete Care includes 5 water flosser tips, but also includes 2 heads for the brush, which brings it to a total of 7 tips. Do you need the toothbrush,too? If you’re looking for a complete dental care system that includes a water flosser and a toothbrush, then the Complete Care would be a great choice. It’s a space saver since you’ll have both tools in one unit and use one plug. However, if you’re not in the market for a toothbrush, then you’ll sure be getting the same features with the Aquarius. In fact, you’ll get an extra feature and that is the Massage feature, and you’ll be getting two extra tips for the flosser. Waterpik Freedom, How It’s Different From Aquarius and Complete Care? Runs on 3 AA batteries (included). Includes a microfiber travel bag. Click here to learn more about the Waterpik Freedom, read the customer reviews and buy it. Should You Buy the Waterpik Freedom? Rechargeable battery uses inductive magnetic charger. Water reservoir capacity 45 seconds. Click here to learn more about Waterpik Cordless Advanced Water flosser, read the customer reviews and buy it. Helix Sleep vs. Casper Mattresses, Which Of These Is Best For You To Buy? One of the best things about Helix Sleep is the fact that it is a mattress fully customized to you and your needs. Before ordering your mattress, you’ll have to answer a few things about yourself like your height, weight, body shape, how you prefer the firmness of your mattress and a few other questions. If you’re buying a couple’s mattress, then you’ll love the fact that you can actually create dual personalization so you and your significant other can get what you want each on your side of the bed! (see how the personalization works in the video below). a mattress customized to your personal liking. Dual-comfort customization: you can have the mattress split with each side customized differently, or you can choose a blend of the couple’s results to create a medium solution. Latex for air flow to keep your temperature cool and for a comfortable bounce. Microcoils for effective weight distribution, pressure relief and spring. Each Helix Sleep mattress is made to order and ready to deliver within 7 to 10 days. All materials are 100% made in the USA. Available in sizes: Twin, Twin XL, Full, Queen, King and California King. Mattress ships compressed in a box. Click here to learn more about Helix Sleep Mattress, read the customer reviews and buy it. Casper is an award-winning mattress that combines springy latex with high-density memory foam to create the perfect mattress. This combination gives you just the right amount of contouring for your body while providing a healthy bounce. The Latex foam has an open-cell design that allows the air to flow openly beneath your body, which ensures you’re sleeping in the right temperature. 4-layer foam and latex combination construction. durable support foam for added durability and support the deep comfort foams. Mattress contours to your body to relieve pressure. The latex has an open-cell design that allows air to circulate beneath you and keep your temperature cool. The latex and foam combination gives you just the right amount of sink and bounce. Mattress shipped compressed in a box. Click here to learn more about the Casper Mattress, read the customer reviews and buy it. Which Is Better To Buy? A Casper or Helix Sleep Mattress? Helix Sleep gives you full control over how you want your mattress to be. Actually, the customization goes as far as two different customization in one mattress, making it a perfect solution of couples who each have different requirements. Casper has a 4-layer design and it combines memory foam with latex for the best body contouring while giving you great air flow to keep you cool. Helix Sleep uses hundreds of microcoils for the best weight distribution, pressure relief and spring, it also has latex on top for air flow. If you prefer the contouring of memory foam, Casper will provide you with it. It’s been designed to offer you just the right amount of sink and bounce. So you won’t feel like you’re sinking in it like your typical memory foam mattress, yet, you’ll still get the pressure relief benefits memory foam is known for. However, we totally prefer the idea of a fully personalized mattress like Helix Sleep, which is made for you as an individual and takes in consideration every aspect of your body and personal preferences.